Summer evenings can be just as busy as school nights, so it’s great to keep some cold salad recipes on hand. We love this one because it has all our favorite flavors and is so easy to pull together. I shared my Southwest Quinoa Salad recipe over at It Is A Keeper this month. Quinoa is one of my favorite bases for a cold salad, and I love that it’s filled with protein vs. a pasta salad. When you make it ahead of time and let it chill, it soaks up all the flavors of the dressing. Yum! We pack cold salads like this for swim meets so we can keep up our healthy eating routines and save money by not spending so much at the concessions stands. 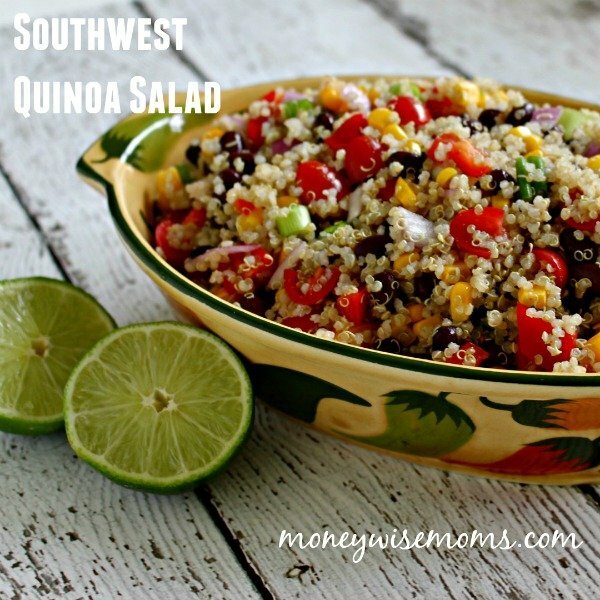 Give my Southwest Quinoa Salad a try, and let me know what cold salads your family likes. I’d love some new ones to put in the rotation! I apologize for missing last week’s Linky Party. Those last few weeks of school hit me hard. There were so many extra activities–concerts, parties, awards nights, volunteer needs–plus afterschool swim practice (which meant carpool for me). We are finally on summer vacation now (day 2–whoo hoo! ), so I’m back on track and excited to see what you have to share! Please link up to three food-related posts that have never been linked up here before. As a thank-you for linking up, we will pin your recipe to the Tasty Tuesdays at Creative K Kids Pinterest board. Please follow the board to see all the great food recipes! Note–posts containing alcohol also will not be pinned. NEW: MoneywiseMoms is not responsible for stolen images or misuse by others who have found your image through MoneywiseMoms.com. By linking up, you agree to let any of the co-hosts use your pictures and links if they decide to feature your post. Your photo may also be used for promotion on any of their social media outlets. Oh YUM! I will definitely be coming back for this Southwest Quinoa recipe! I love anything tex/mex and I’ve been trying to incorporate more quinoa in my menus.